Imagine saying hello to a robot you know by name as it rolls around your neighborhood, making door-to-door deliveries like your local postman or milkman. For Spanish last-mile logistics robotics startup Eliport, its friendly couriers-on-wheels are just one aspect of the smart cities envisioned by governments and tech companies worldwide, running alongside driverless cars, drones and other IoT devices. Founded by former heads from Glovo and Degustabox, Eliport produces autonomous delivery robots that travel at walking speed on pavements and in pedestrian zones, servicing small communities. They run round the clock as part of a larger Eliport setup, picking up parcels from a few collection hubs in the neighborhood, and delivering and unloading them into secure postboxes installed at buildings or houses. This way, residents get their online shopping delivered on time, even when they aren't at home. "The main problems of the delivery industry are due to human factors, couriers' mistakes,” said Eliport's co-founder and CEO Dmitry Skorinko, referring to failed deliveries and damaged packages – the last-mile problems that have frustrated customers, retailers and delivery operators for decades. Such issues in turn are barriers to scaling the business and making last-mile delivery more efficient. "That’s why I switched to a creative solution with robotics,” said Skorinko, who was the former CTO of Spanish on-demand delivery startup Glovo. He teamed up with Degustabox's former Head of Sales Patrick Synge to start Eliport in 2017. When Degustabox's food boxes were sent to subscribers, they often "arrived broken or they wouldn't arrive at all," Synge, who is also Eliport's Chief Partnership Officer, recalled. "And when you have a subscription service, every part of your experience is extremely important. So, I understood that we needed to do something to improve the last part of the experience." According to the company, its potential annual revenue could exceed €2 billion based on delivery of 1.78 million parcels daily at its current pricing –equivalent to 0.1% of the global e-commerce market worth US$2.29 trillion in 2017, a figure seen to reach almost US$4.5 trillion by 2021. As online shopping continues to grow, the automation of last-mile parcel delivery will become more urgent. Many types of robotic delivery solutions are already being developed and trialed by tech startups, as well as logistics and e-commerce companies around the world. Last-mile transportation of goods, from a distribution centre outside the city to the customer's home or final delivery destination, alone accounts for 53% of total transportation costs currently – set to fall as robots increasingly replace human couriers. Based in Barcelona, the co-founders hope to raise €500,000 this year. Its funding to date is about €115,000, including a €50,000 grant from EU Horizon 2020 and over € 20,000 from the co-founders' own pockets. Commercial trials will start this year too, with pilot installations in several locations in Seville, Spain and Florida, USA. Finding local investors interested in Eliport’s project hasn't been easy. “Barcelona is perfect for a software startup, but anything related to hardware is much more difficult,” said Skorinko, noting there is hardly any activity or community in this area. “This is why we are also speaking to people from outside the country, mostly the US and Asia." The Eliport co-founders believe that as smart cities and IoT increasingly become the norm, a whole new last-mile logistics robotics market will come about. Scheduled deliveries will make up the bulk, or 95%, of this business – which is Eliport's market. The balance 5% relates to on-demand delivery. The company plans to produce an average of 2,000–2,500 robots yearly, servicing markets in at least four to five countries. The robots will initially be manufactured in Asia in collaboration with third parties. Longer term, Eliport is seeking control of the entire production chain. About 120 robots will be produced annually during the first four years, scaling up to 2,000 robots yearly for the fifth and sixth years. By the seventh year, the company should be able to expand at a much faster rate and make 12,000 robots annually for more clients around the world. About 50 staff will be employed by the end of 2020 with the headcount reaching 200 in 2021, the co-founders said. “By that time, we'll reach a point where it's interesting for other companies to invest in or acquire Eliport," said Synge. When Eliport launched its crowdfunding campaign in March 2018, Glovo's co-founder Oscar Pierre tweeted the news, voicing support for Skorinko's plan "to revolutionize the last-mile delivery problem with autonomous robots." The crowdfunding exercise raised over US$44,778 from 72 private investors, with the co-founders closing the campaign earlier than scheduled to focus on raising seed funding at a later date. Around the same time, the company also brought on board two advisory board members: Lukas Neckermann, who comes with experience in smart city and autonomous technology; and Michael Müller, a well-known robotics and mechatronics expert. Differentiating itself from competitors, Eliport puts forward an eco-friendly, community-centered solution in last-mile logistics. 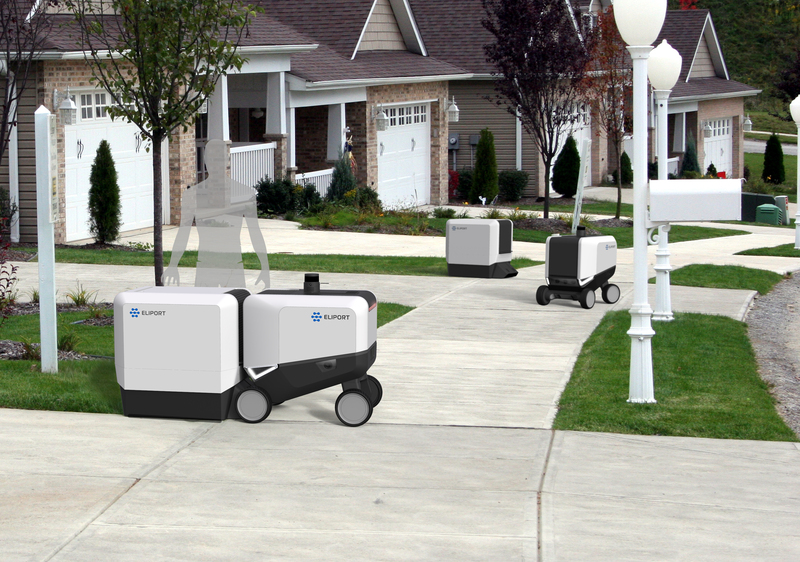 Its neighborhood setup of robots moving between the collection hubs and dedicated Eliport postboxes was created to avoid problems like traffic congestion, since there will be less delivery trucks and couriers from different vendors circulating in the community once Eliport becomes its main last-mile delivery company. The customized infrastructure will be installed for free for each neighborhood. Each participating customer household pays a fee of about US$20 per month while the delivery companies will be charged 30–40 cents for every parcel dropped off at any of the Eliport collection hubs in the neighborhood. “On average, we can earn around €1,200 per robot per month. Each robot can earn around €14,400 per year, or € 72,000 during its five-year lifetime,” said Synge. A special map of the neighbourhood is first drawn up to enable the robots to navigate and carry out their tasks accurately at the correct position of the postboxes. The robots are equipped with ultrasonic sensors for more precise location detection and obstacle avoidance. The postboxes can be easily opened and locked by the robots using plastic security tags. Advanced features based on IoT may be added to create smart postboxes that can send notifications to homeowners and delivery robots to inform them whenever a postbox is full. Last year, Eliport won the "Best e-delivery company" award at a logistics conference in Barcelona. So far, there are about 20–30 competitors that use delivery robots. Several communities have already expressed interest to try out the Eliport robots in Spain and the US.